Exciting news in my life- I'm going to Bonnaroo this Summer!!! I'm so excited I could pee. Yes, that is a level of excitement and it's exactly how I feel. I just want to fast forward to June & all the festival excellence. I've only ever been to SXSW, Bamboozle and Warped Tour before, so this is a HUGE deal for me. As much as I would like to say I'm spending all of my energy being excited about the music and whatnot, that would be a total lie. At this point, I'm geeking over the fashion and whatnot of the whole festival environment. The adventurous part of me is very excited, but the part of me that likes to look pretty is kind of freaking out. I'm not the best camper, actually. Well, that is to say that I don't camp. So Bonnaroo might be kind of tough for me. I really want to be the kind of girl that can just be badass and all rough and tough like Katniss Everdeen (srsly obsessed) but I'm just not. I like my flat iron, I like my make up, and more than anything, I really really like the ability to shower (even though I don't always utilize it.) Bonnaroo is the exact opposite of all of these things! I know that as soon as I get there, I won't give a crap what I look like- I'll be wrapped up in the music and getting into trouble. But I'm trying to pre-plan as much as possible so I don't look like a curly haired frizz ball freak! (Yes, I have curly hair & bangs. This girl without a flat iron is a mess!) Basically, I've decided to abstain from washing my hair, let it get greasy, and just embrace my inner hippie. Head scarfs, hats and lots of wacky clothing are going to be my uniform while at Bonnaroo. Anyway, enough about my freak out. 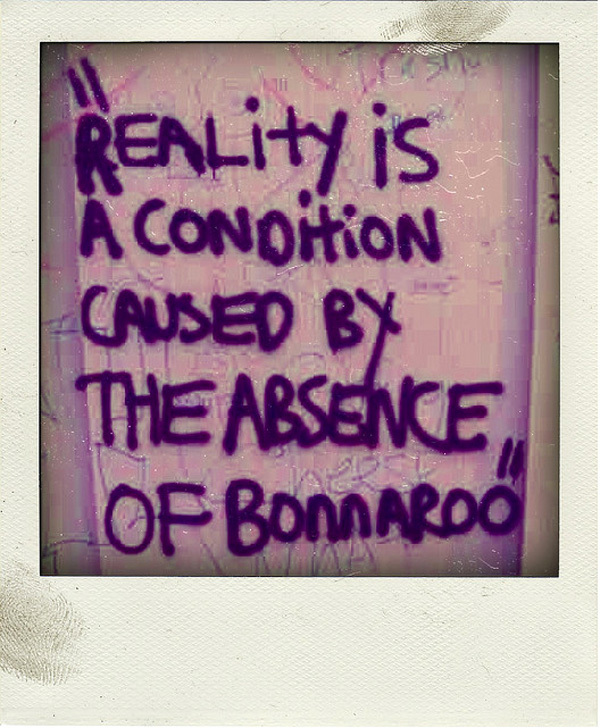 I seriously can't stop thinking about Bonnaroo, which leads me to Google endlessly. I'm constantly researching, daydreaming and all around obsessing. Here are some random internet finds related to my future Bonnaroo experience. Who else is going? 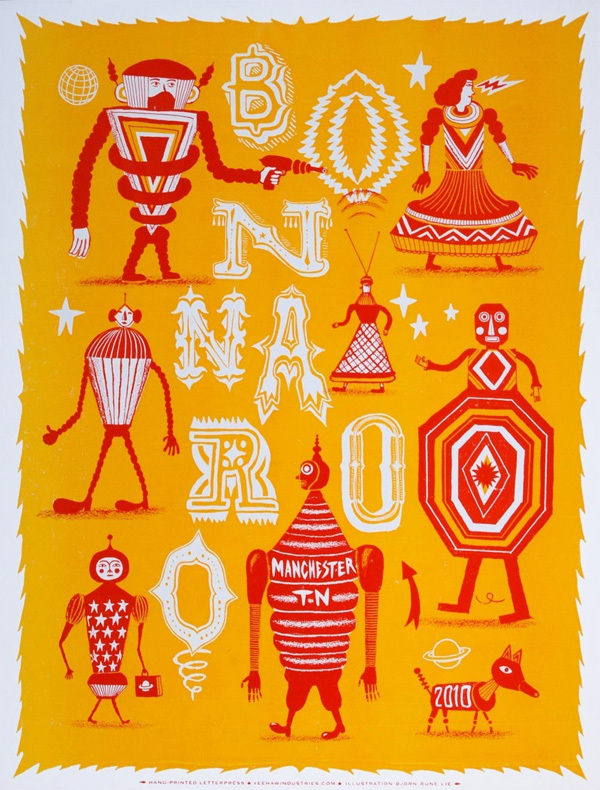 This print on Etsy has me swooning. How cute! I know I'm going to end up buying all sorts of prints, t-shirts and whatnot while I'm there. Trying to resist the urge to buy before I even get there. Must.... save... money! 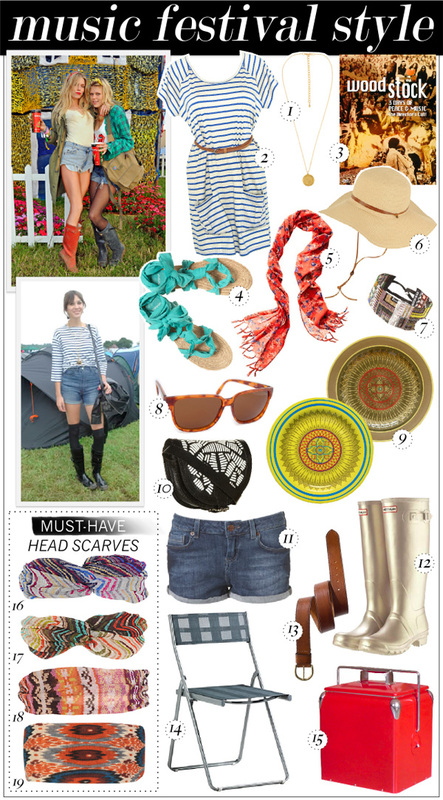 I'm pretty sure I've obsessively looked over every single music festival style guide the internet has to offer. This one is super cute!! Tribal print scarves are on my shopping list before I leave for Bonnaroo, for sure. That and maybe a pair of used cowboy boots! I already have a pair of rain boots but I think vintage cowboy boots are more my style. Srsly though, just fingers-crossing-it that it doesn't rain!! Next up, I think I'll have to make my own style guide pre-Bonnaroo! 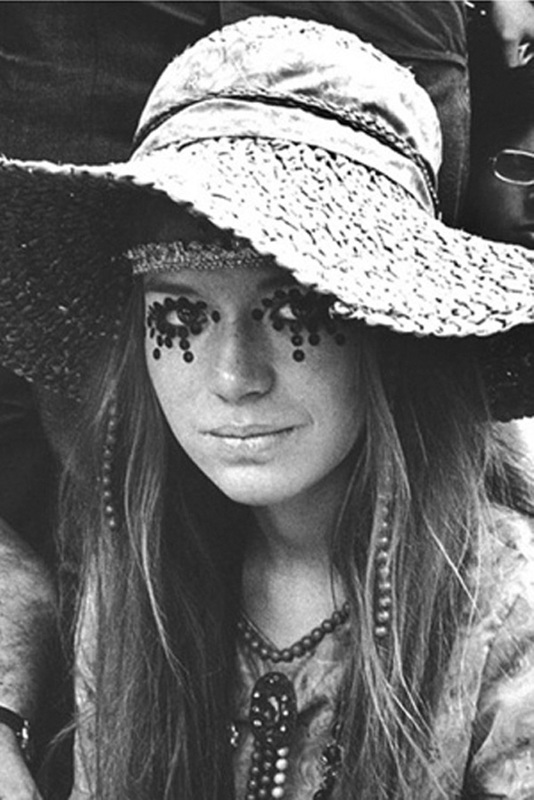 This pretty lady from Woodstock is basically going to be my fashion inspiration for Bonnaroo. Quirky, hippie and all around awesome. Whoever this lady is- she's my fashion idol. Looking at this photo makes me want to get in my car and drive down to Manchester, Tennessee three months early. I'M SO EXCITED! This probably sounds weird, but I'm really stoked to be a part of something bigger than myself. A shared experience with others. 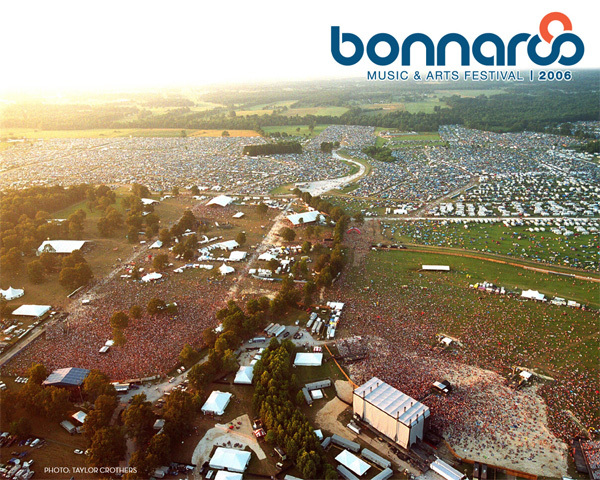 To just be a speck in the big Bonnaroo landscape, ya know? Um, okay. Have you guys heard of this called Silent Disco? Basically, you get a set of headphones, and someone DJs and everyone in the room is listening to the same thing, but if you don't have the headphones on, you can't hear the music. Basically, it's the coolest thing ever! It looks like SO much fun!!!! I might be more excited about the silent disco than I am about seeing anybody actually perform. I MEAN- JUST LOOK AT HOW MUCH FUN THESE PEOPLE ARE HAVING!!!! June, you cannot come quickly enough. Anyone else making the trip down to Bonnaroo this year? I'm going with four lovely ladies- we're driving down. Actually, we're doing a huge road trip down to New Orleans first and then looping back up to Bonnaroo. Crazy, right? Essential life experience right there- road trip across the country. Yes, please! I'm really hoping it turns into a Britney Spears' Crossroads experience... but one of us would have to get pregnant for that to happen. No dibs! ANYWAY. More details on that when we actually solidify dates and stuff for the trip. I just couldn't resist posting about it any longer though. I'M SO PUMPED!!! I'm dying I'm so jealous! You are going to have so much freakin' fun! That's awesome! I'm sure you'll have an awesome time. I'm a four year veteran of Lollapalooza in Chicago and planning to go again this year. Music festivals are awesome, and Bonnaroo always sounded cool. Good luck with the camping--I've never been to a festival involving camping. One piece of advice--if they are calling for rain, buy a poncho pronto, style be damned. I scoffed when my mom suggested I take one but I tell you: I would have killed for a poncho. The day it rained was barely seventy and with the wind it was fuh-reezing. (This was a few years ago, last year it rained too but it was warm and not nearly as awful.) Also, comfortable footwear is crazy important. Flip flops fall apart and after all the grossness I've seen lying around at festivals...yeah, you don't want to expose your feet to that. You are SO right!!! I'm definitely going to go with Chuck Taylors, cowboy boots and rain boots. SO EXCITED!! SO JEALOUS. SO SOSOSOSOOSOSO JEALOUS. YOu better take a million pictures and come back and tell me all about it so I can live vicariously through you. Ahhh! I'm extremely jealous. I've always wanted to go to Bonnaroo. Coachella sounds fun too, but Bonnaroo is closer. I can't wait to see pics! You lucky goose.